KSAR CHAR BAGH. A oasis of peace. RIAD AGUAVIVA SUGGESTION: If you’re many days in Marrakech it is the ideal place for a day off, swimming in the big pool, have a lunch (have restaurant) or make a traditional hammam. It is not far from Riad Aguaviva. 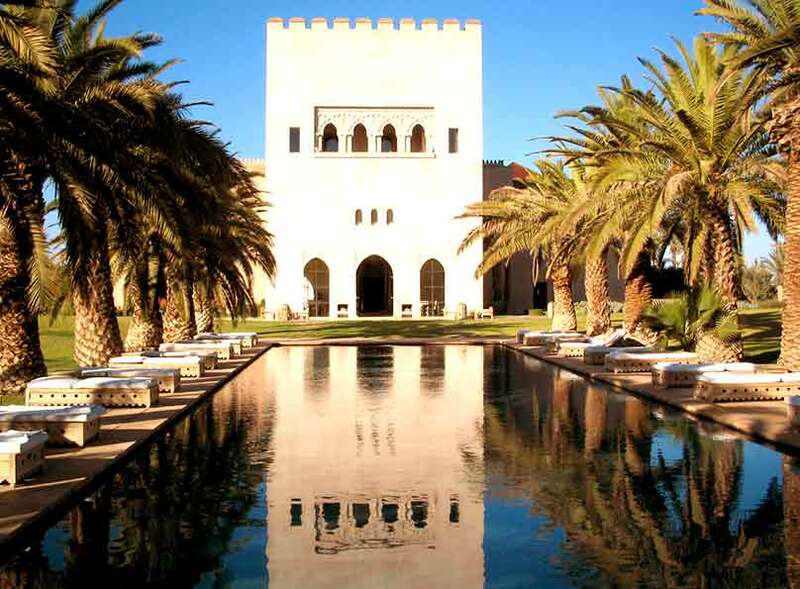 Ksar Char Bagh in the Palm area had been on my list of dream destinations since a well-traveled, terrifically picky friend visited Marrakech several years ago and ended up fleeing another luxury establishment which she hated (hated! ), seeking refuge at this chic concrete fortress designed to resemble Granada’s Alhambra. A discreet retreat off the beaten path, Ksar Char-Bagh appears like an oasis in the desert, and like many places in Marrakech, the scale of its beauty is only evident once you pass through the hulking 20-foot-high engraved metal entrance door. The palm tree–shaded pool there is an olive grove, a citrus orchard, fig trees, and the remnants of a Berber village—one of the age-old adobe houses has been transformed into a gym. Another, which no longer has a roof, serves as an en plein air spa pavilion in the warmer months. Since it was chilly (and raining), I went back inside and tip-toed down a shadowy staircase—the whole place has the feeling of a palace from ancient times—to the spa. To be honest, I was exhausted: worn out from my strenuous relaxation odyssey. So after another glass of that heavenly Moroccan mint tea, I stumbled lazily into the hammam, whose red marble glowed in the candlelight. In the center, rose petals floated in an octagonal marble basin. It was a spacious room, where an entire party could sit for a steam, which is actually how it is traditionally done in Morocco: hammams are social places. I skipped the exfoliation this time (a person’s flesh could not be smoother than mine by this point). I was traveling in Marrakech with two girlfriends. We did not stay at the Ksar Char-Bagh, but will definitely be back there if we are in the region again! To start, we were shown into the beautiful poolside garden for apertifs. The scene was calm and relaxing, and we were captivated by the property setting. Next, we were seated in the main dining area – it was fall, so a bit chilly to eat outside. The table decor was simple, yet elegant – inspirational! Our server was incredible, making us feel like we were the only table and anticipating our every wish. Then, there was the food – oh, the food! My friends hadn’t traveled much, so were trying new things, but every dish was served to perfection, so they were pleasantly surprised by how much they loved each bite. The Chef pairs classic with inventive, and portions are just right for a delightful meal. I even loved how the server suggested a walk in the gardens in between our first two courses and the main to ensure we had enough of an appetite to fully enjoy. My husband and I visited Ksar Chag Bagh in November 2015 for a romantic, child-free weekend. We loved pretty much everything about the hotel. The service was incredibly professional yet personal (flowers for our wedding anniversary, a private cookery lesson arranged on request, amazing massage and facial at the hammam). The hotel is as beautiful as the photos. And they’ve recently added a new orangerie and outdoor area for events and weddings. We stayed in a Ksar Chag Bagh suite with great terrace; I can only imagine what the bigger ones were like as our room was utterly perfect with lovely touches, lots of storage, gorgeous bathroom, comfy seating area and open fire.